When Galaxy Quest first came out, I didn’t understand why husband liked it so much. I am not a huge sci-fi fan, so all of the references were lost on me. But then it grew on me and over time it became one of my favorite movies. My husband and I now regularly insert various quotes from it in our conversations.1 One of my favorite quotes comes from Tim Allen’s character, Commander Taggart. 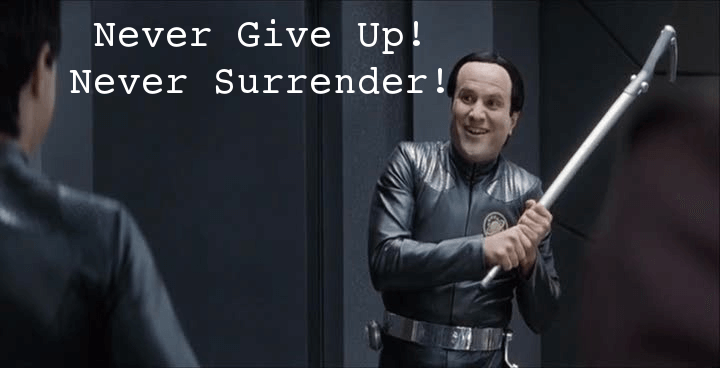 His tagline from the Galaxy Quest tv show is “Never give up! Never surrender!” What starts off as a trite, overused line becomes a powerful phrase when the Thermians use it as their inspiration to stand up to the bad guy, Sarris. For me, the dieting industry was my Sarris. Once I realized this, like the Thermians, I needed to remind myself to never give up and never surrender when facing my opponent. Intuitive eating is not an easy journey, and many newcomers hope for a smooth, quick journey. I hate to be the one to break it to you, but it will be neither. I remember crying on my porch one night early on because the concept of intuitive eating just seemed out of reach. Dieting had lured me in over the decades and leaving that behind seemed like I would be abandoning part of who I was as a person. I had begun to label myself with words implanted by the dieting industry like “fit”, “disciplined”, and “slim”. It became a huge part of my self-identity and when my team of professionals asked me to give it up, it felt like I was being asked to change the essence of who I had worked so hard to become. Though I was torn, deep down, my logical mind told me that pursuing intuitive eating was for the best. I was tired, hungry, cranky, and had trouble concentrating, all symptoms of a chronic dieter. Because I was miserable, I agreed to try intuitive eating not only for myself but for those around me.2 Oh man, it was tough! The inevitable bumps in the road happened. Some of the bumps were teeny while others were large enough to do serious tire damage in this metaphor. Bumps often occurred for me when I had an appointment with my dietitian. Yes, she was an IE-focused dietitian, but she pushed me harder than what was comfortable. I had slowly lost weight, so my pace of putting on weight would also be slow, but she wanted to see quicker gains.3 There was inner conflict too. My food rules were so ingrained that the eating disordered part of my brain would duke it out with the logical part of my brain that was trying to heal. This seemed to occur regularly at first but then slowly dissipated as time when on. And when I mean slowly, I mean slowly. It took me about two years to finally feel like I was an intuitive eater. One of my many challenges early on was simply eating a small snack when hungry rather than waiting until my meal time.4 I remember the first time I ate a mid-morning snack at work every day for a week. I had been trying to eat something small for my snack but I resisted. There were weeks when it was only a few days per week. Sure, that was better than before, but there were still days when I let myself be hungry. After a few months, I finally got to the point where eating a small clementine or the teeniest banana was acceptable to me. One day, I had finished my Friday snack and realized that I had eaten a snack every single day that week, and not because it was a rule but because I had honored my hunger. I sat with that thought for a moment. I knew this was something to acknowledge in some way, so I texted my husband to tell him. His response was that he was proud of me and that I had made progress. It hadn’t occurred to me that what I did was anything extraordinary. Most people snack when they’re hungry, but my husband pointed out what I had glossed over; it was a big deal for ME because of where I was coming from. I had eaten a mid-morning snack every day at work despite it being against my food rule. I felt victorious! Though it took a few years, I now make sure my mini-fridge has snacks for me. I declare that food rule conquered! Your intuitive eating journey will be bumpy and you may feel like giving up. Those days come but they also go. That means that you will not feel this way permanently. It’s like a wave. There are peaks and there are valleys. You may be in a valley right now, but a peak will eventually come. Looking for any silver lining can help you change your mindset. What has been going well with intuitive eating? Find something even if it’s minuscule. Progress is progress. Say something nice or even neutral about your body, just not something negative! Remember that you are human and your feelings are valid. You would be kind to others if they were having a bad day, so why not be kind to yourself, right? You deserve the same consideration and compassion that you would grant others. Do you have nuggets of wisdom of your own? Please share them in the comment section for others to see! 2Because I was tired, hungry, and cranky, I was not always the funnest person to be around. It was a low point for me, and I am grateful for my loved ones who put up with me. 5Credits: a) My fellow IE-ers on the IE community forum: You are my therapy between therapy sessions, b) My team of professionals: Your guidance was invaluable. Sorry for being such a pain sometimes though!, and c) Most importantly, my husband: I don’t know what to say. I hope my lack of words encompass my gratitude. Podcast Version: Never Give Up! Never Surrender! This was very encouraging for me. Even if you know it is not going to be easy when someone shares their bumps and reminds me that it is not easy, it helps. Thank you so much. I agree that knowing you’re not alone makes the journey a bit easier. I’m glad my words helped in some way!